I just thought of something, I had to have a new tire put on at discount due to catching a nail, do you think the SH-AWD is throwing a code due to the very different tread depths under hard accelleration? I put the new tire up front due to it being prodominately FWD. I remember something about Subaru needing to to change out 2 or even all four tires to keep the same tread depth otherwise damage could accur to the AWD system. Somebody check me here if im wrong. Somebody has to have gotten this fixed. The code just disappeared after being on for 2 months. But it is only a matter of time before it comes back I am sure. is there any aftermarket support for a new/different turbo? $4500 is like a new manifold/kit for most platforms! ... I put the new tire up front due to it being prodominately FWD. The 2009 RDX owner manual says to keep the same size tires on each axle: front or rear - and that means replace two tires, not just one. However, if your old tires are not very worn, then I suppose you could replace only one tire. Just keep in mind that the handling might be compromised, and also that different sizes of tires on the same axle, will cause the differential (either front or rear) to *work* harder, since the two tires will be rotating at different speeds, even when going straight - in other words, all of the time, not just when turning. no, because you said the new tire is on the front - but I am only guessing. Just what is the code? how can we even guess without the code? I've never been able to drive directly to a shop without clearing the code by turning off the ignition. Next time it does it I will try. I have the same problem. Tried all the standard diagnostics. Dealer says that turbo has to be replaced - waste gate problem. Have any of you thought to remove your turbo and give it a good cleaning? The turbo collects a lot of dust in 40,000 miles. I would have thought of this before taking my car to the dealer for the problems you are describing. Maintenance is #1 to the proper mechanical responses from a car engine parts. Codes often only sense the problem not the actual part so could be a number of issues need checked before replacements. Not so easy to remove the turbo housing. Clean exactly where? just wondering as I have never heard this suggestion before. The water and oil passages in the housing are sealed. The air intake side should be OK because of the engine intake air filter, unless it has been neglected or damaged. And the exhaust side of the impeller housing, may be coked from exhaust gases - is that your suggestion, for cleaning? and how to clean? Clean exactly where? just wondering as I have never heard this suggestion before...and how to clean? Your turbo gets dusty. You should clean your turbo with a loofah, every 40,000 Li. problem is acura doesn't want to honor warranty issues in my experiences with acura dealers and manufacturer. if the turbo gets dusty as air filters get dirty and oil then there should be auto maintenance on this feature. I vacume mine or have cleaned at an independent rep. Mine is doing well, but I am strict when it comes to taking care of my car. are you saying you clean the airbox? Because how do you "clean" the turbo if thats what you mean? well my 2007 RDX Tech had the same problem. Driving down the interstate and the check http://www.militarybrat.com/birthcerts.cfm and SH AWD lights came on. Checked the video display and there was no power to the rear wheels in the display. Stopped at the dealership on the way home and they identified that the seals on my turbo failed, they showed me a light oil film inside my intercooler. Quoted me just over 3k for the turbo and 900 for labor. Stated that there is oil bleeding through the turbo into the intake and causing the check engine light, plus there is a loss of power from the turbo so the computer identifies the power loss and shuts power to the rear wheels. Can this turbo be rebuilt or is it a replacement? I haven't had issues with the CEL. however I did have a light oil film on the inside of my intercooler. this will happen on a turbo motor that has 0 issues due to the crank case ventilation system which circulates fresh air through the crank case to cool the engine oil and also remove moisture and combustion gasses that get past the rings. bottom line get a good degreaser (I use purple power) and a decent sized tub fill it with HOT water and stick the intercooler in it and agitate (shake it). be sure to remove the sensors first! after you no longer have any crap coming out of the intercooler dry it off reinstall sensors and pop it back on you should be good to go. if a seal goes on a turbo your going to have the entire back of the car covered in dirt. and your most likely going to see a trail of smoke following you down the road. Thanks for the alternative diagnosis. The oil in the intercooler was clean and had made it all the way through it and into the the hose to the intake. That said, it makes sense that the turbo did not fail since I did not have any debris on the rear of the vehicle and did not see smoke behind. After getting over the shock of the cost, i had them reasseble the car and I drove home. The trouble lights did not come on, but the turbo boost guage did not register any boost. I did baby her on the way home but i did accererate quickly a couple of times and she seemed much slower and the guage did not register. If this ends up being a turbo issue, can it be rebuilt? After reading all this it makes me worried the turbo is gonna quit before i even pay the car off. Is this a really common issue? I haven't really heard of the turbo itself failing, especially the seal of the turbo itself. The turbo is cooled via oil and engine coolant yes? So if that's the case you would think overheating wouldn't be an issue. I'm all paranoid now. I have technical proficiency just not the cash flow to fix this if this was to quit. as a general rule yes turbos can be rebuilt. another thing to look for, is you engine using oil between changes? I don't mean like 1/8 of a qt I mean like 1-2 qts. about not having any power did you have a cel coming home from the dealer? if so make sure they put the intercooler back together right by: checking the hose clamps the sensor hook ups and the bypass valve connections. the dealership is notorious for F#$%^& up cars. if your local id be willing to donate time to try to help. also Ebay for used turbos they go for around 450-700 +shipping. way cheaper then a dealer. Barely uses an 1/8th so I'm good i guess. At what mileage did this occur, what year car? no CEL as you say - any other indicators? and why was the intercooler *opened* for you to look inside? which oil have you been using? following the MID for oil changs? since I have not read any other posts indicating this condition, wondering if it is indeed *normal*, as you suggest. just wondering how I would know if this has happened to my own RDX. Thanks. dcmodels the short answer is yes this has happened to your rdx. 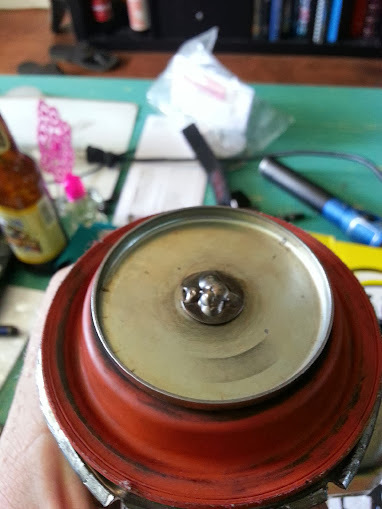 every motor of every configuration I've ever taken apart has had an oil film in the intake track from where ever the crank case system dumps into it all the way to the intake valve in the head. in the case of the rdx it dumps in right before the turbo inlet and this is where I am trying to figure out how to mount a catch can in this location to give the oil vapor a place to fall out of suspension. most of the other factory turbo cars have them available via the aftermarket support they receive. once I figure out how to do it ill post a DIY. 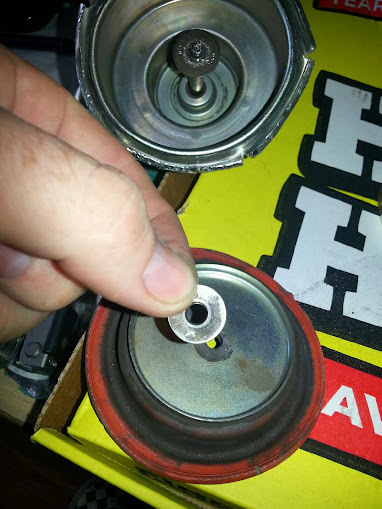 the catch can I installed on my jeep pulls a massive amount of crap out of the crank case and prevents it from getting into the intake track. this occurred at 20,000 miles using amsoil with no cel. opened it cause im nosy. dcmodels the short answer is yes this has happened to your rdx. ... this occurred at 20,000 miles using amsoil with no cel. opened it cause im nosy. Well, now wait - the car model in your signature is a 2008 RDX, although you did not reply specifically to my question concerning the year model of you car. So, did you purchase the RDX *new* or *used*? Did you first check the intake at 20K from new, or from your purchase date? I ask these questions, because if the PCV valve sticks closed, that will not allow the crankcase to vent, even when the Turbo does not presurize the crankcase (and close the PCV). And that will cause oil vapor to exit the valve cover and go into the turbo intake even when the turbo is not spooled-up. The following poster indicates that his RDX has no oil in the turbo intake, I do not doubt that yours does, just wondering why the difference? perhaps the car in the following link had low miles? The following link does discuss catch-cans, and I would certainly be interested in how you mount a catch-can. Last edited by dcmodels; 02-18-2014 at 07:50 PM. Any other updates on this issue? My 2007 with 126K miles just started throwing this code so something is definitely wrong. From reading on the forums, seems like the most likely problem is one of the 3 solenoids since the turbo seems to spool fine and no oil leaks or anything. But before I go and order the parts and try to replace them(the 2 wastegate solenoids are buried in the back of the engine and very difficult to remove) did anyone else replace those solenoids and resolve the issue? no loss of oil and i change it bases on the MID and this is about every 5K or 6K. No the CEL did not come on. I pulled the turbo and had it inspected by a local turbo rebuild shop and the actual turbo is good. That said, it appears the variable Venturi control actuator failed. Did a vacuum check on it and it seems the diaphragm is bad. Now I can not find just the actuator. Acura only wants to sell a complete turbo assembly. Any recommendations? The milage on my 2007 is just over 134,000 with the last 36K mostly highway. The CEL came on at highway speed (75-80 mph) with the SHAWD light also. The dealer pulled the code and it is the turbo fail code. I guess to demonstrate this the dealership pulled the intercooler and showed me a light film coating of oil. I have been using mobile one synthetic called for. I use the MID for oil changes and am getting between 5 to 6 K between changes. Is the variable venturi actuator inside or external to the turbo body? just not sure what you are describing - and is the diaphram metal/ rubber/ what? just trying to understand how this was actually repaired, and why the actuator cannot be purchased? looking foward to any pics. thanks. Glad that you got her going again and for way less then the dealership wanted at that! I think if enough people start asking for it then they need to mask it available. It is the top set of vacuum lines that run to the turbo and is external to the turbo but bolted to the entire housing. The diaphram is rubber and is inside the metal chamber. I am unable to answer why the actuator is unavailable from ACURA, but we were told to get it you had to purchase the entire turbo. Still working the pics. wow thanks for the update and the description of the fix. I replaced the solenoids in hopes that that was the issue but after replacing, I still see the P2263 code show up so I was thinking the wastegate actuator/diaphgram is bad on the turbo. Can the actuator be removed from the turbo? If so I don't see why Acura can't just sell that part instead of making us buy a whole new turbo. Which actuator is it? the one towards the top or the one towards the bottom of the turbo? Do you think it would be possible to remove just the actuator without removing the turbo from the engine first? That turbo is buried in the engine bay and looks very very difficult to remove. Did you get to it from the bottom of the car? Thanks in advance for any additional info. I'm thinking I'll have to do the same fix for my car since changing the solenoid didn't fix the issue. The turbo part number is the same for all year RDX so I would think all model year would be susceptible to this issue. True, but sometimes parts are revised without the part number changing. For instance if they switched to a different manufacturer that makes a better quality version of the same part, the part# may not change. Sadly I have no idea how to find something like that out with certainty. yes it is the upper vacuum housing on the top of the turbo. you should be able to remove it from the turbo without removing the entire turbo. can not explain why Acura does not sell the actuators separately. i used "all data" for the sequence to remove it. did not think to document the sequence separately. the turbo come out the top. to gain clearance you have to remove almost everything from the drives side of the engine compartment. the airbox, the fuse box next to it, disconnect the brake maser cylinder from the firewall and flex tie if off to the side, drain the coolant so when you disconnect the heater hoses, the heat shield, and all the vacuum lines to gain clearance. the entire assembly is surprisingly large and requires a lot of space to get it out. the most difficult parts to remove was the oil lines and the bolt in the turbo support bracket at the bottom(access and angle). ltcjim505 was nice enough to send me the pictures he took of the actuator so I'm posting here for everyone to see. Bottom picture looks to be the washer that broke off the actuator rod when he first took it apart. Top picture shows the actuator re-assembled and the washer welded back in place. My light came on for which I think is the 6th time now saturday night when I was out with some buds and I have to say it is disapointing. Did you have to do any cutting to remove this part and is this the true solution? Im on my last stand with this RDX and I'm tired of throwing parts at it hoping for a fix.